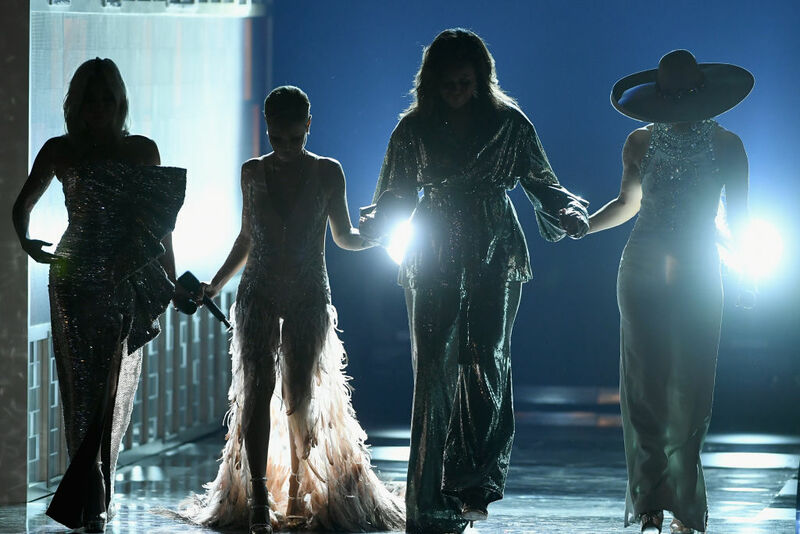 Viewers of the 2019 Grammys were blessed with a moving surprise appearance from none other than our forever FLOTUS, Michelle Obama, as she opened up the ceremony in Los Angeles alongside host Alicia Keys, nominee (and already the winner of three Grammys tonight) Lady Gaga, performer Jennifer Lopez, and presenter Jada Pinkett Smith. Walking down the backlit stage steps hand in hand to uproarious applause, each woman took a moment to explain how music guided them through their youths and continues to inspire them when society tries to deny their power. Hearing Obama’s words about representation in art—and why it matters—was simultaneously motivational and cathartic as we begin to consider the 2020 election and what the potential reelection of Donald Trump means for our futures. After Jada Pinkett Smith connected music to underrepresented voices—”Every voice we hear deserves to be honored and respected”—Michelle Obama took to the mic to describe being a little girl with a record player on the south side of Chicago. Michelle Obama always shows up right when we need her (oft in a sparkling ensemble, because why not?) to remind us of our power, and we thank her.